Since being founded in 1934 by Rai Bahadur Mohan Singh Oberoi, the Oberoi Group has over 30 hotels in 6 countries. In India alone, Oberoi boasts 13 luxury hotels each offering the highest quality in service, food and comfort. The Oberoi Hotels & Resorts brand pride themselves on delivering luxurious surrounds and facilities. In addition to this, at every Oberoi property you will find exceptionally attentive staff. Their warm and inviting environment will ensure your stay is nothing less than unforgettable. From the many exceptional Oberoi properties, one of our favourites is The Oberoi Udaivilas in Udaipur. Having won countless award over the years including Asia’s leading hotel 2016 and 2017 at the Wold Travel Awards, its no surprise that The Oberoi Udaivilas experience is unparalleled. Located on the banks of Lake Pichola; the Udaivilas are spread across 50 acres of land, providing outstanding views of the hotel’s stunning gardens and Lake Pichola. In addition to the spectacular scenery, the property also features a twenty-acre wildlife sanctuary home to deer and wild boar. The layout of the hotel is rather unique with interconnecting domes and corridors reflecting the layout of Udaipur itself, whose seven lakes are linked by canals. Sunlight illuminates the domes and walkways that offer magnificent views of the surrounding lake and gardens. The property itself is a sight to behold, with the food matching the hotel’s high standards. The range of fine international and Indian cuisines served at the indoor and al fresco restaurants will definitely set the bar high for any future dining experiences in India. While the amenities, pool, views, food and spa are all incredible, it is the staff that make The Oberoi Udaivilas a place you just won’t want to leave. You truly feel like part of the family when you stay at the Udaivilas. The staff cater to your every need going above and beyond to make you feel at home. Read any review online and you’ll find hundreds of compliments praising the Udaivilas staff for service excellence. Another one of our favourites is The Oberoi Amarvilas in Agra. Found at the end of a sweeping driveway lined with native trees and lit by flaming torches, the position is unrivalled. Just 600m away from the Taj Mahal, each room offers unparalleled views of the outstanding monument. The offerings don’t stop at luxury amenities. By day, guests can travel in private golf buggies to the Taj Mahal. At night, they can enjoy private balcony candlelit dinners. Enjoy Ayurvedic spa treatments at the Oberoi Spa, a swim in the stunning pool, complimentary cocktail hour and luxury dining where you can enjoy fine international and specialty Indian cuisine. Synonymous with the name, The Oberoi Rajvilas also boast world-class luxury facilities. The beautiful “Pink City” of Jaipur offers the perfect backdrop. Constructed around an 18th century Shiva temple, with Mughal arches, gold leaf murals, high domed ceilings and beautiful crystal chandeliers. 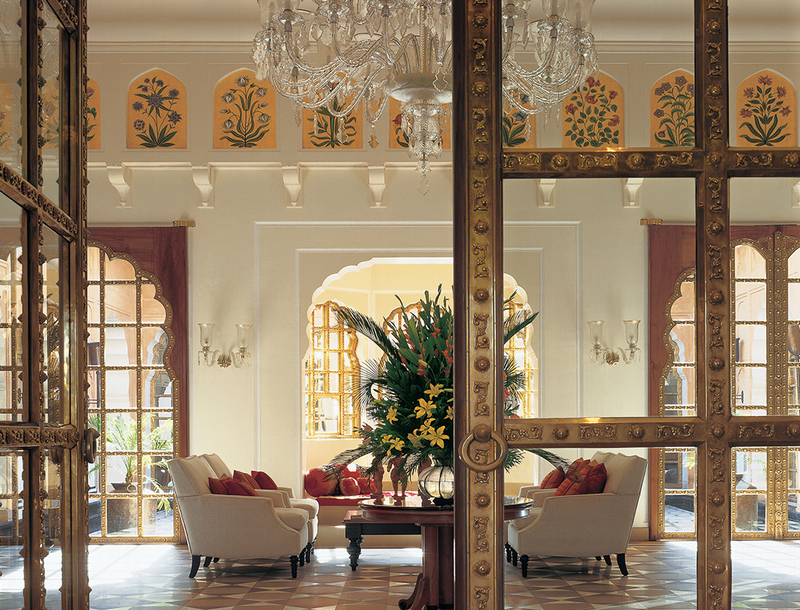 The Oberoi Rajvilas are the epitome of Jaipur and Rajasthan culture. Within the temple guests can experience chanting with a Hindu priest, meditation and morning yoga. This royal resort is set in a thirty two acre oasis of landscaped gardens filled with beautiful trees and exotic birdlife. The Oberoi Spa in Jaipur is located in a restored 18th century haveli (mansion). Here you will find Ayurveda inspired as well as Oberoi treatments aimed to help guests relax, refresh and rejuvenate. Among the unique experiences on offer at Rajvilas, the interactive Rajasthani art displays, the live culture performances as well as culinary demonstrations are all “a must”. Each of the Oberoi hotels feature outstanding amenities with exceptional staff. Their accolades are no surprise so indulge in an Oberoi stay and you won’t regret it!